EMF bed canopies are designed to keep out electromagnetic fields, which can be harmful in high levels. People have suggested that EMF pollution could cause all kinds of problems, from weight gain to joint pain. If you’re worried that EMF pollution is keeping you awake at night or perhaps even causing problems like headaches, a canopy can help to protect you. As well as offering you protection at night, it also looks good and can lend your bed a fairytale look, which both adults and children can enjoy. 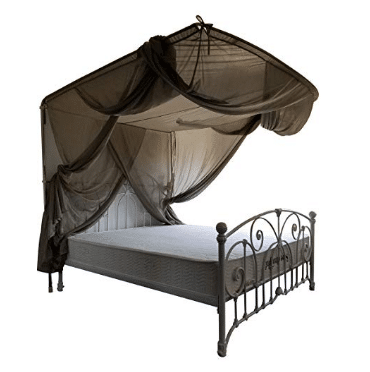 Finding the right EMF bed canopy requires you to take a few different things into account. You need to know what sort of protection it’s going to offer you, and what sort of material it’s made of. Of course, it’s also important to get a canopy that’s the right size for your bed. In addition to shielding for over your bed, you also need to consider shielding under your bed to get the protection that you want. With the right EMF bed canopy, you could get a better night’s sleep, which is excellent for your overall health. Sleeping well helps you to heal, regulate your weight, keep your skin and hair healthy, and maintain both physical and mental health. You have a good choice of EMF bed canopies, but you don’t want to be overwhelmed with options. 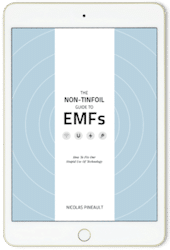 Take a look at the options below to find the EMF canopy that’s right for you. 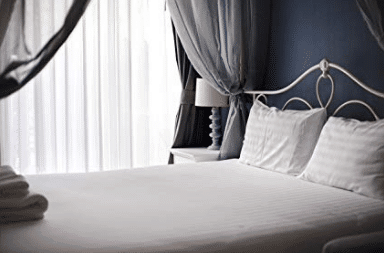 Made with special Naturell fabric, the voile offers a protective layer to your bed. The fabric is entirely natural, made from cotton, and helps to reduce signals from WiFi, phones and other devices. Available in six different sizes, it offers a softer and thinner fabric option compared to the Blocsilver, which is a little stiffer and not as fragile. You need to be careful with this fabric to avoid damaging it, but you might prefer the softness and the transparency compared to other options. Putting it up is simple, with a screw fix hook and hoop included so that you can tie the fabric to the dome and expand it. The canopy is good quality, although you do need to be careful with it. If you need to wash it, handwashing is best to avoid damaging the fabric. The thin fabric is aesthetically pleasing because it’s easy to see through, and lets light in if you want it to. While other canopies feature earthing, this one does not as it is not surface conductive and doesn’t need it. But it does claim to offer the highest protection from high frequency radiation from a canopy without earthing. Some people might feel more comfortable using something under their bed along with the Swiss Naturell Bed Canopy if you want extra protection. Adding a ground mat could be necessary if your bedroom is above the ground floor level. If you’re prepared to invest in the Swiss Naturell Bed Canopy, it’s a nice lightweight option that does the job and protects you at night. Blocsilver offers an alternative fabric for your canopy. It is a little heavy than Naturell, with more of a silvery gray color, instead of the pristine white of cotton Naturell. This fabric is silver coated nylon mesh, which is more breathable than Naturell and also has antibacterial properties. It also offers excellent protection, with an attenuation of 10MHz – 3GHz 35-60dB, making it stronger than Naturell. Unlike the Naturell canopy, this canopy is available in eight sizes, offering two more, one of which is a crib/cot size for babies’ beds. It’s easy to install this EMF canopy, with hooks, straps sewn into the canopy, a length of cable and a crocodile clip included for easy installation and to keep it in place. The strong fabric means that you don’t have to worry much about accidentally ripping it. It’s durable thanks to its silver coating and nylon makeup. However, it’s important to remember that it’s still fairly delicate, sheer material, although it’s tougher than some other options. 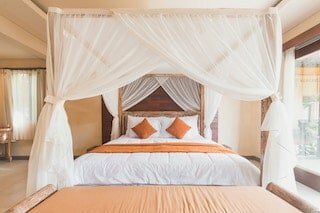 Again, you need to add a ground mat if you want extra protection for your upstairs bedroom, so bed aware that it’s not something that comes with the canopy. When ordering, it’s a good idea to measure your bed first to see what size you need. You might discover that you require a larger size than you thought. One other thing to note is that the radiation protection lasts up to 50 washes, giving you plenty of use but meaning that it doesn’t last forever. UK MANUFACTURED from 100% Pure Silver polyfibre EMF shielding fabric. Anti bacterial lightweight and very breathable material. This canopy also uses Blocsilver fabric, which is made from nylon and silver mesh to block out EMFs. This shielding dome canopy has a strong attenuation of 10MHz – 3GHz 35-60dB. It comes with the other advantages of Blocsilver, including being antibacterial. It’s designed to block out high levels of EMFs and comes with an earthing cable and grounding kit to provide extra protection. It’s possible that you might want to also add a ground mat if you’re trying to deal with high frequencies. You can get the canopy in five sizes, ranging from full to large California king. It again offers the excellent breathability of Blocsilver. With its long length and easy earthing, you can use this canopy for mattresses without bases or for camp beds, cots and other low beds that are close to the ground. You can quickly set it up with the screw fix hook and the tri glide which hooks over it to suspend the canopy. You can adjust the canopy height up to 1.5m from the ceiling, which is a nice touch to ensure you get it in just the right position. You can expect to pay more than the other Blocsilver option for this version, but it could be worth it for the adjustable height, along with the included earthing. It makes it easy to get around one of the disadvantages of Blocsilver, which is that it’s important to earth it. Comes with free under bed floor protection for the ultimate shielding experience. Highly recommended for those seeking refuge from the deluge of wi-fi networks. If you want another Naturell canopy to consider, this one from Lvfeier gives you another possibility. When you buy this canopy, you can choose from an adjustable rope or a stainless steel bracket to install it. The adjustable rope allows you to have more flexibility for where you want to hang it. This canopy is available in just one size, measuring 82.7 inches long, 78.7 inches wide and 63 inches high. Because it’s adjustable, you can make sure it fits the way you need it to, and move it away when you don’t need it. You can pull it up and it’s easy to disassemble when you want to. It’s also useful as a mosquito net. Made from all natural Naturell fabric, the canopy offers effectiveness of 99.99% or 40 dB at 1000 MHz. Install it in just 15 minutes and it will be ready to go for your first night’s sleep. The sling allows you to hang the canopy directly without any fixtures and means that you can even use it while camping or sleeping outdoors. Like the other canopies, this one doesn’t come with a grounding mat, so you will need to buy one to use along with the canopy if you think that you need extra protection. 2 ATTENTION please: Our canopy needs 7-9 days to be produced, so the deliver day while be put off one weeks. But the canopy is brand new and Fine workmanship. 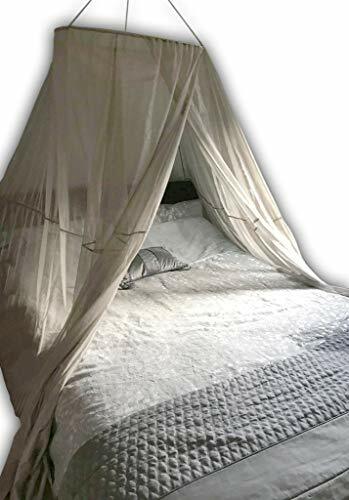 3 DIMENSIONS:82.7 Inches Long; 78.7 Inches Wide and 63 Inches High.Our soft & light fabric netting has tiny holes which keeps mosquitos and other insects out, yet allows a cool breeze in - for comfortable, natural protection and a peaceful night's sleep. 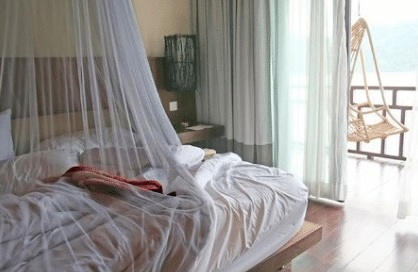 4 Structure: Retractable mosquito net with stainless steel tube bracket,The steel tube bracket can support the canopy in an attractive shape and is easy to install, so there is No need to hit the wall. And the structure is stable and not easy to be deformed. 5 Made in the china from Swiss Naturell, fully washable and 100% natural. Enhance your sleep and rebuild your immunity. Easy to assemble, comes complete. 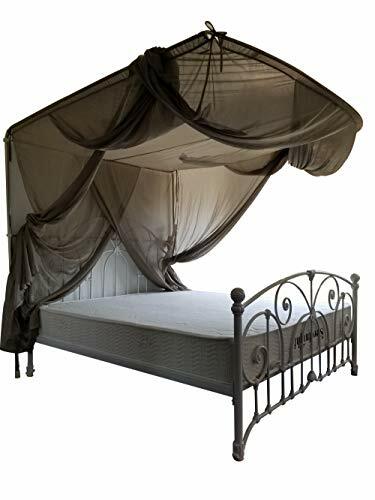 The Dream Canopy RF Shielding Canopy has been designed to fit both queen and king size beds. It measures 96 x 468 x 96 inches, giving you an 8.2 foot height and 39 foot perimeter. Made from a sheer, transparent material, it still allows light to come through so that you can enjoy the morning sun or the moonlight. It’s also breathable, ensuring good circulation while it helps to protect you from electromagnetic fields. It has an easy access slit on one side, which means that, unlike some other canopies, you don’t have to lift the whole thing up to get in and out. One of the advantages of this canopy is that it folds up small and weighs barely anything, so you can take it anywhere with you. 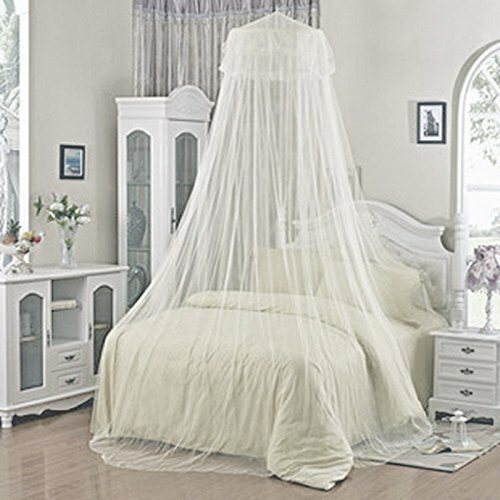 This means it can double up as a mosquito net for a camping trip or you might want to put it over you in a hotel. It comes with a stainless steel ceiling hook and support ring so you can install a permanent base for it at home, and also has a ground cord, which you can plug into a grounded outlet. The cord has an alligator clip so that you can clip it straight onto the canopy or you can even use it to ground other canopies if necessary. Adding a ground mat still might be useful for you, especially if you sleep upstairs. Dream Canopy shields against WIFI, Cell Phone Radiation & Electric Fields! The best value and effectiveness for complete shielding agains WIFI and cell phone signals!!! 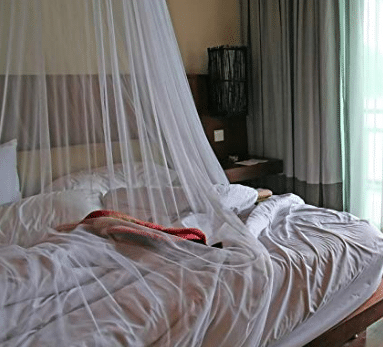 Does double duty as a mosquito net, too! Not just for beds either! Can be used over a couch, workstation, your favorite lounger or hammock. Includes ground cord, stainless steel ceiling hook and support ring. When you’re choosing your EMF bed canopy, remember to check the material it’s made from and the protection it offers. Make sure that it’s available in a size that will cover your bed too, and watch out for sizing issues that previous customers might have had.